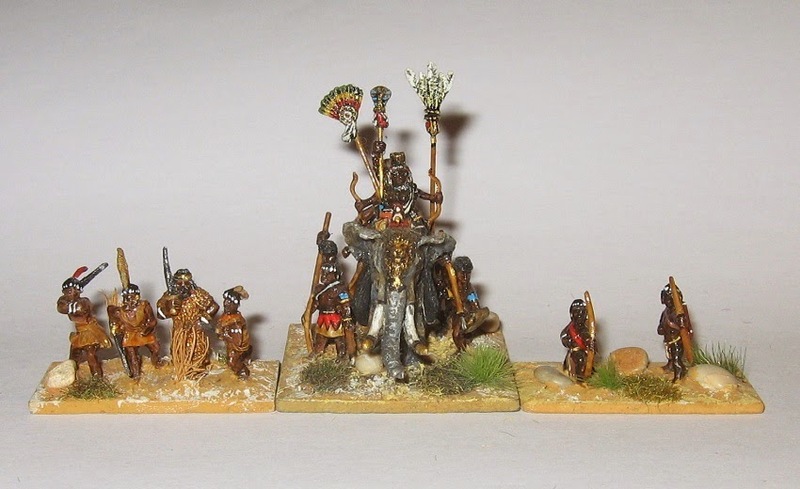 This is the other half of The Axumite Invasion of Arabia pairing: the Axumites. 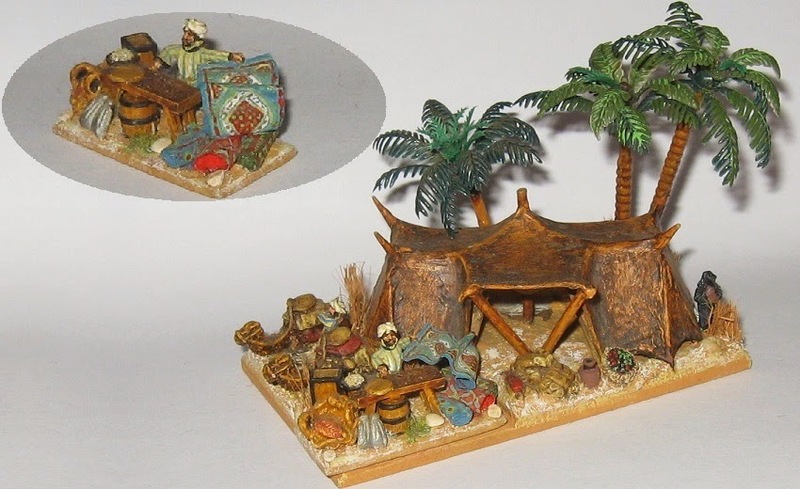 Although it notionally represents king Kaleb's 6th Century expeditionary force, I have included numerous other potentially anachronistic references from the Ark of the Covenant to the Rastafarian colours of modern Ethiopia. 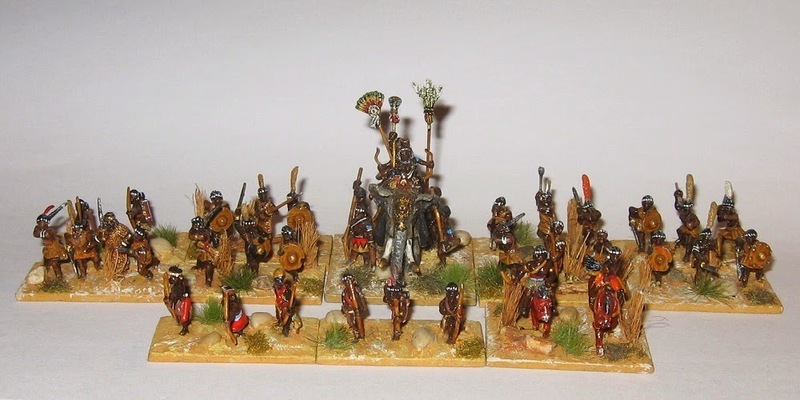 I put 4 figures on the Blade to distinguish it from the Warband elements that make up half the army. 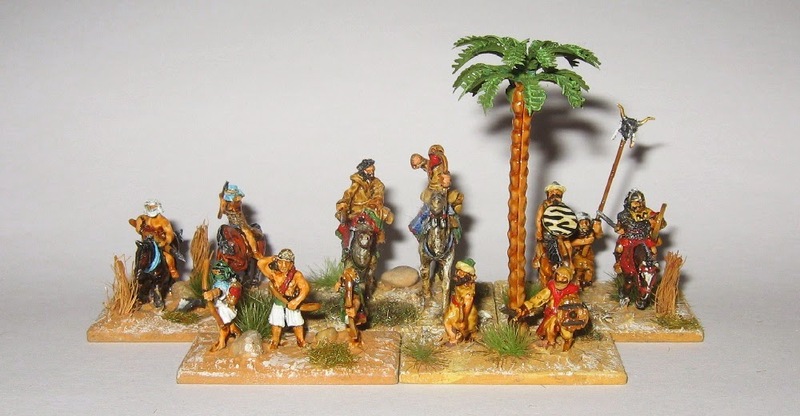 A mix of figures but predominantly Lancashire Games (Colonial period) Sudanese warriors ... I thought they looked suitably up for it. 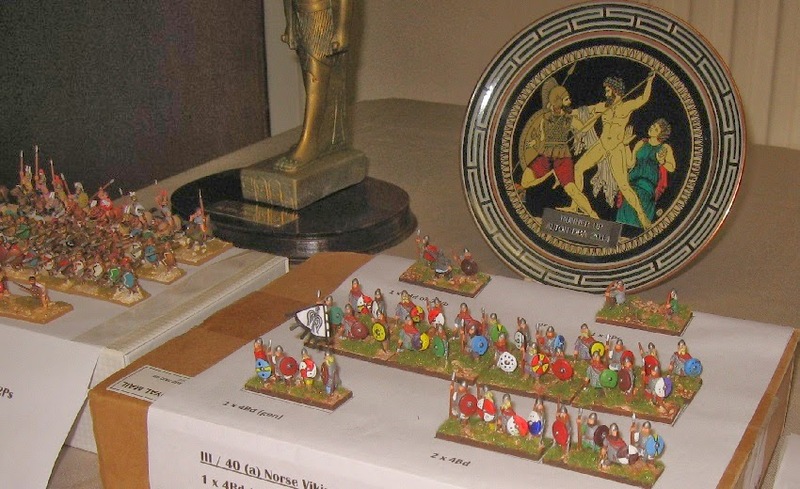 Essex, Chariot, Donnington and Falcon figures. All Essex in this case I think. 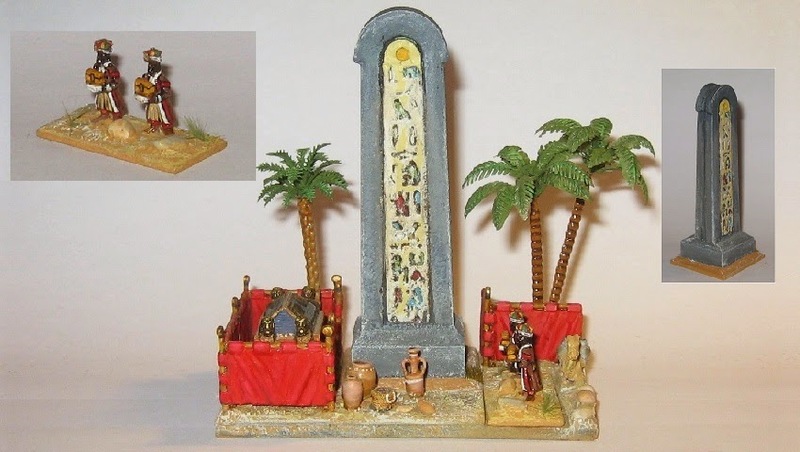 The obelisk is covered in Egyptian hieroglyphs in a clear message to the conquered people of Meroe. 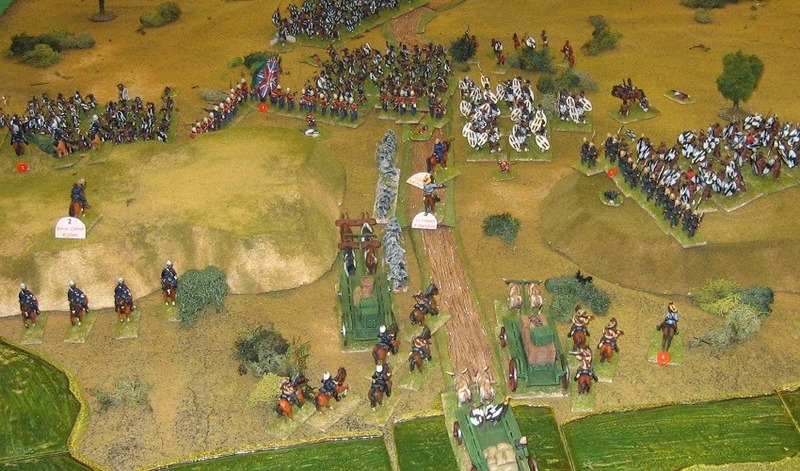 The Warband make this engaging army brittle: in a single rank it is hard to win ... doubled up, you can lose the game in a single turn of combat. The bull (from some plastic Germans) reminds me of the biblical golden calf ... I have allowed the General some fancy armour (he is a Gladiator Goth .. the rest is Essex ..) .. 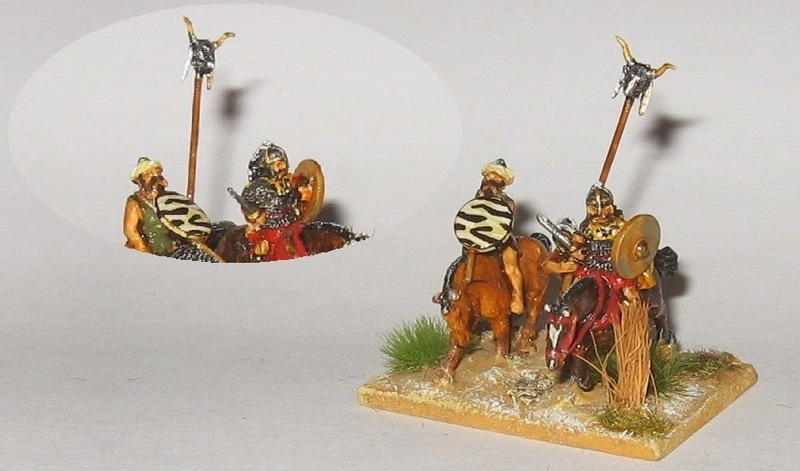 The camel riders ... for Alton I substituted a Blade for one of these to help balance the armies. 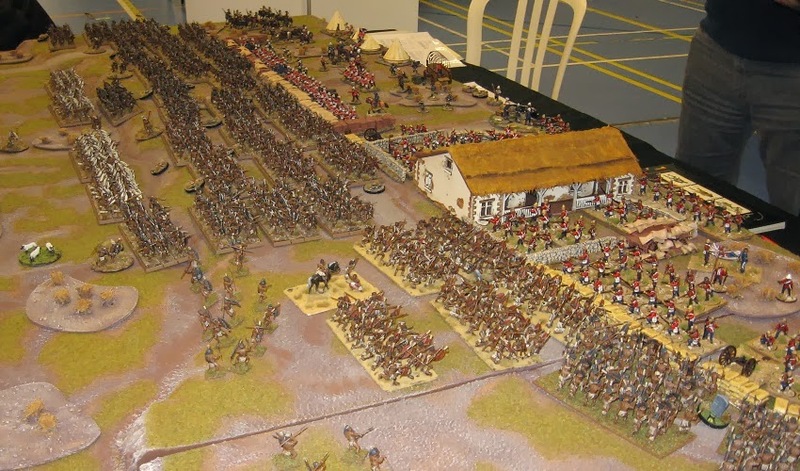 Truth said, this is not a powerful army (except, perhaps, against some mounted types) but seems well matched against the equally unfancied Abyssinians. It quite likes Sand Dunes but they do slow the game, and on Aggression 3 you won't always get them. 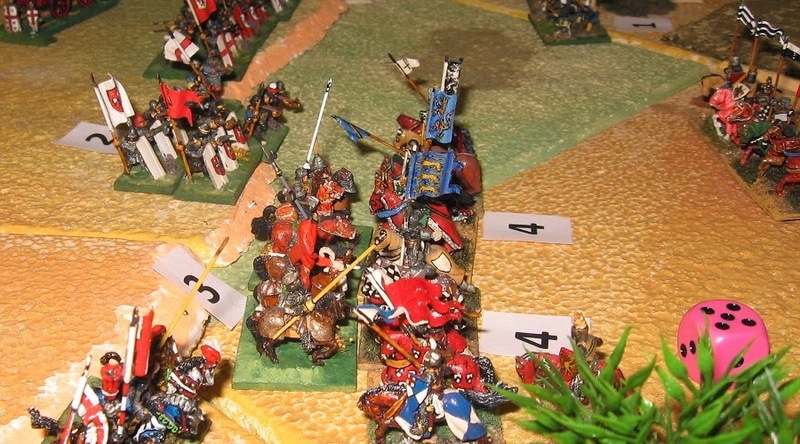 When it is your pair in play, the opponent gets to choose which army to use (and vice versa). 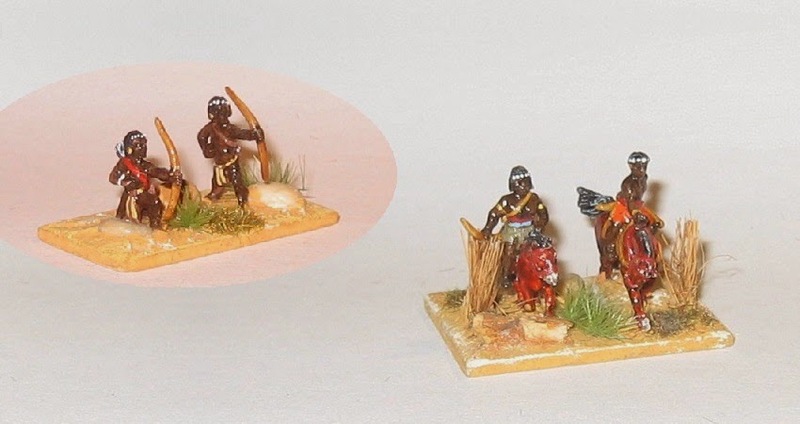 I took a pair to recall 'the Axumite Invasion of Arabia' ... Abyssinian & Horn of Africa (II/62) and Later Pre-Islamic Arab/Nomad (II/23(a) ... We are in the 6th Century AD. We were all present and signed in before 10:00 which meant we were able to have 1 hour game windows, 3 before lunch and 3 after. So 6 games, 3 of which would be with your own scenario. A pretty good return for a day trip to Hampshire. 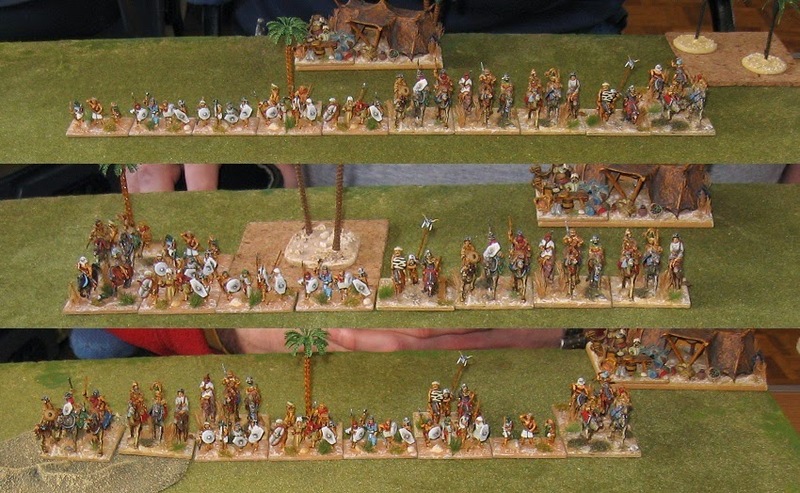 In every case my opponents chose the Arabs (ironically, given I had tried 3 games with my local wargamers during the week, notionally to 'test' for balance and the Arabs had lost all 3) ... one game went down to the wire but the Arabs snatched it, one clear win to the Axumites, and one walk over to the Arabs - so (after 3:0 to the Africans in the week) 2:1 to the Arabs on the day. 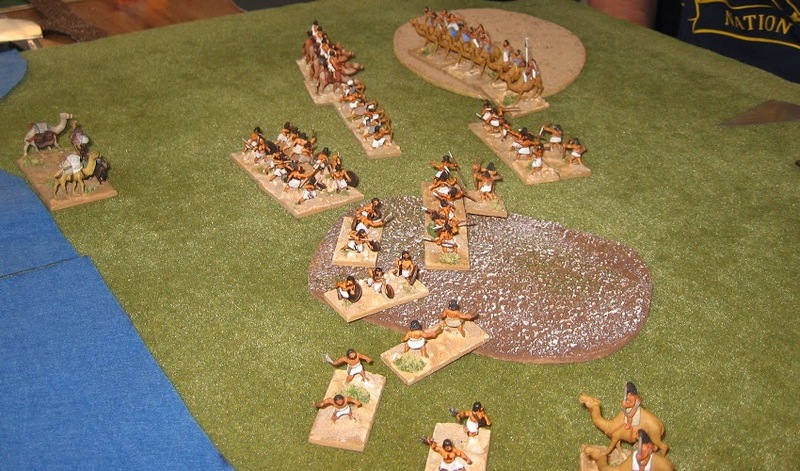 And a rare DBA win with my own armies to me. 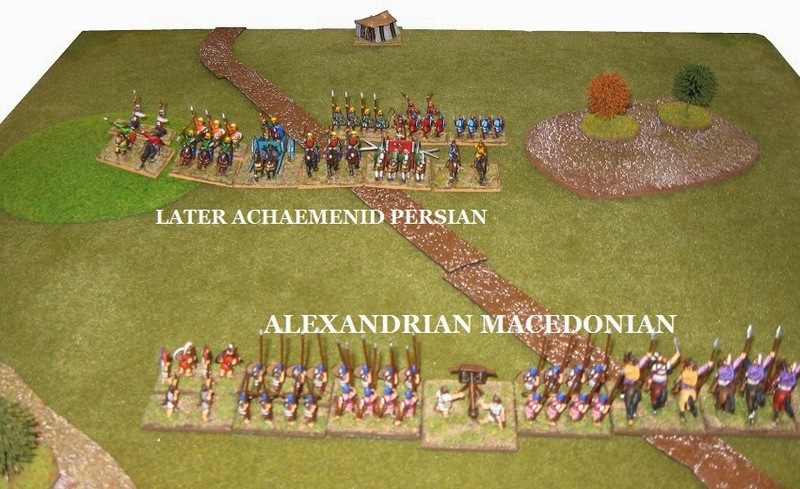 I picked Alexander as he won historically - and also I thought the artillery might give me a long range shot or two. 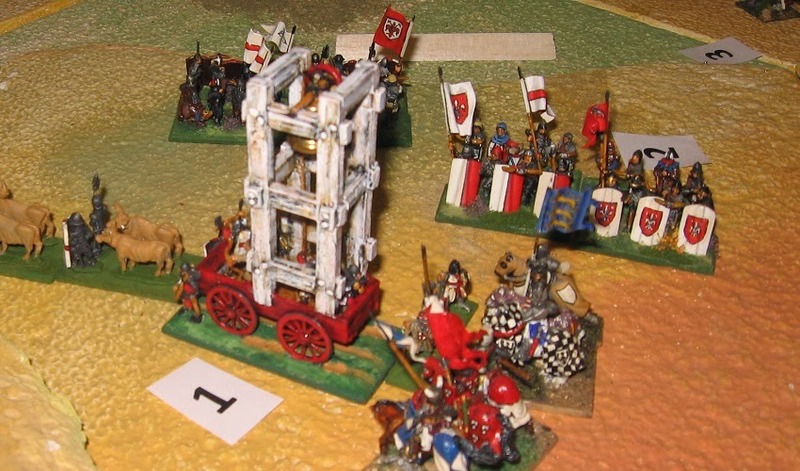 Actually I handled it badly and it got killed by Light Horse without firing a shot, by which time the high rolling Scythed Chariot was in amongst my line. It took a while to sort out the mess and I was 2 down before I really got going. I pulled the deficit back but eventually lost what turned out to be a very close game. A real roller-coaster of a game. 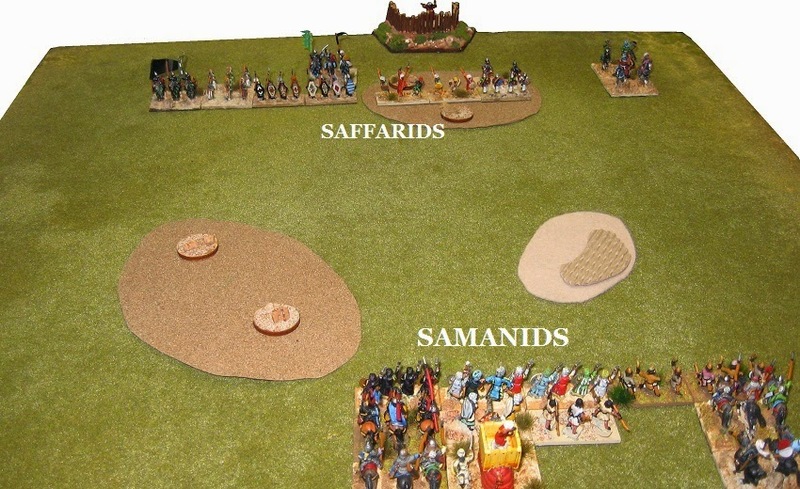 I chose the Samanids because they had an elephant. 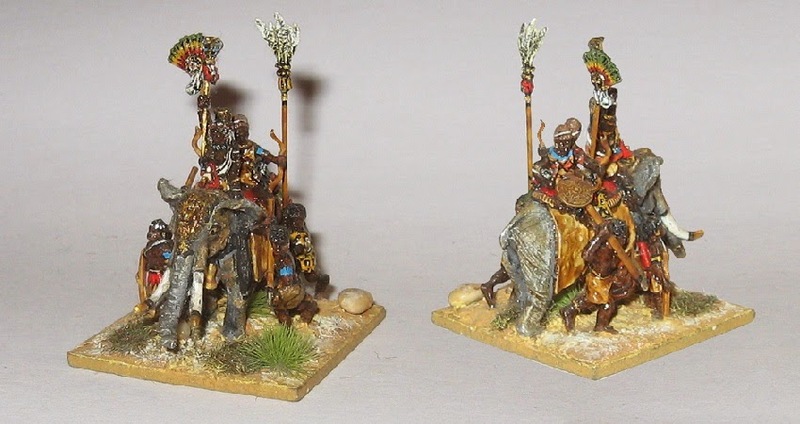 I might have done so anyway (elephants are part of the ancient wargame if you ask my opinion) but further, my opponents were giving me the Axumites all through, so my elephant game was warmed up. 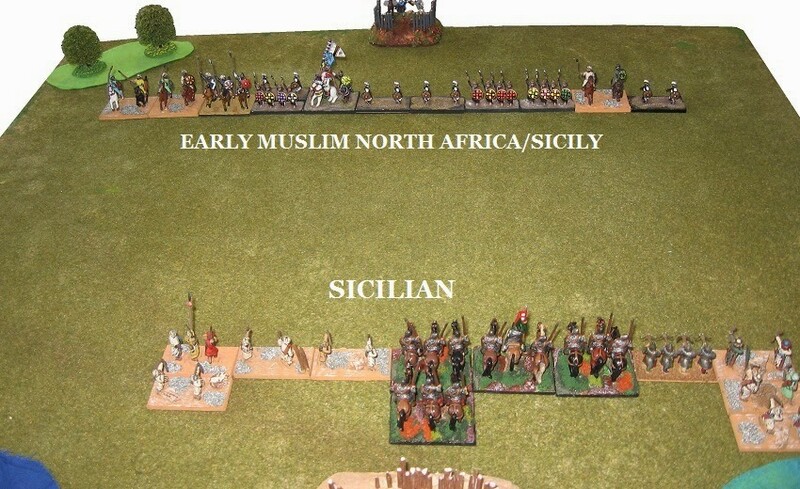 There were lots of other great pairings in play (you wished the day had opportunities to play more of them, really ...) with Early Muslim North Africa & Sicily popping up an improbable 3 times, and Early Bedouin twice. 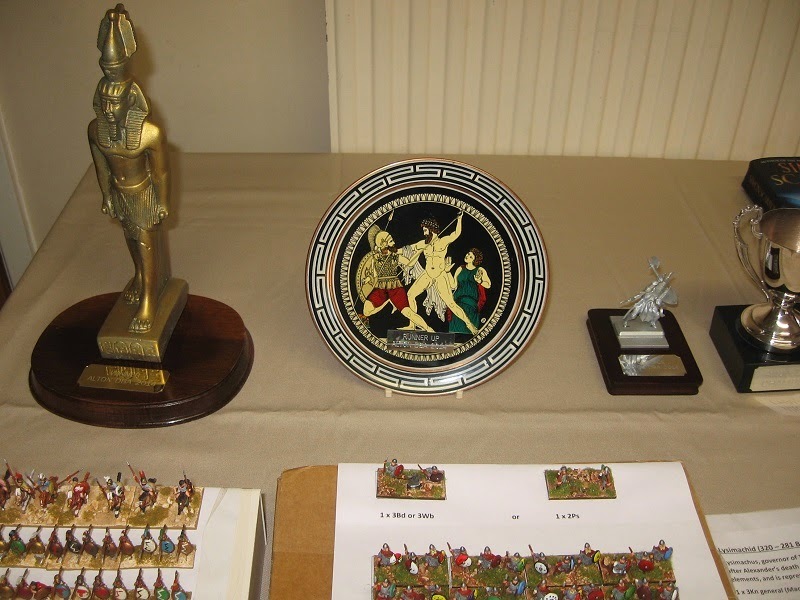 As has become the custom, there was a full table of prizes which players could choose from in addition to the trophies which this year were a colossal Pharaoh for the winner and a splendid Greek style plate for the runner up. Prizes ran from two deluxe painted armies ready to go into action down to individual figure packs, Barker Markers and scenic items ... everyone got something. 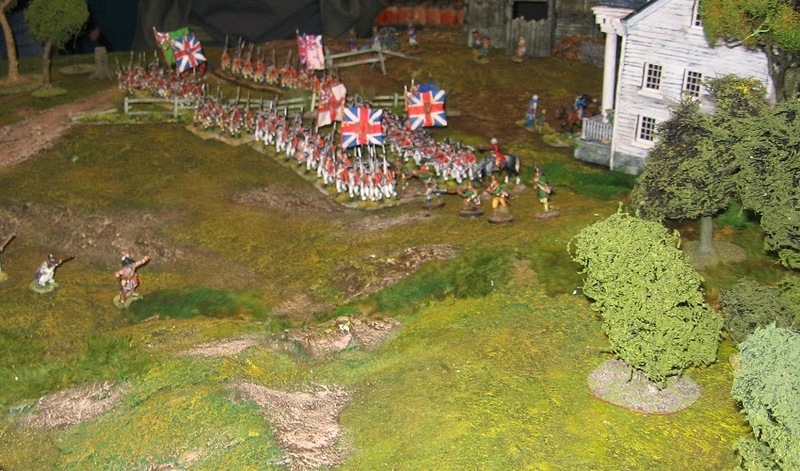 See you next at the BattleDay on Saturday ... or maybe at Salute next month? 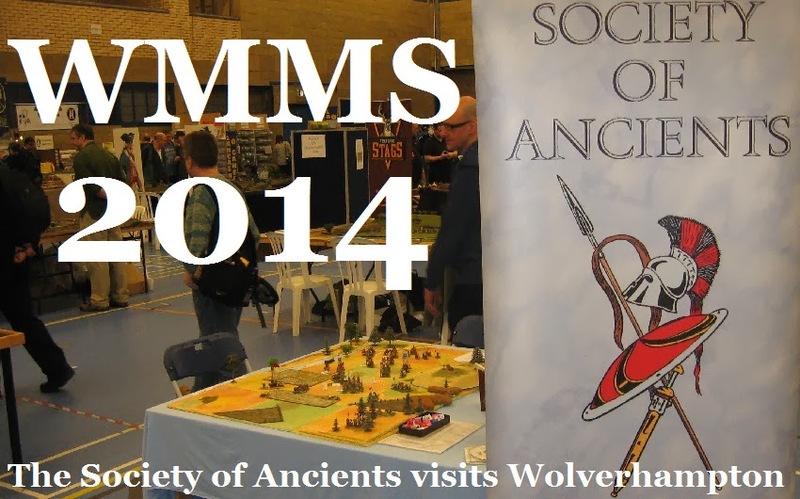 Many thanks to Alumwell for finding space for us at their very friendly and enjoyable WMMS show. 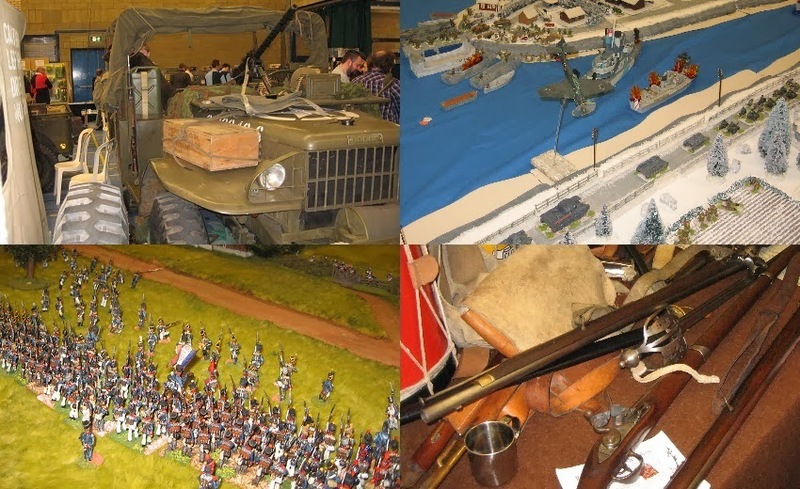 Well worth attending if you can make it, WMMS has, for its size, a really impressive mix of games and displays and all the main traders ... but it retains a West Midlands family feel and you always seem to get talking to people. 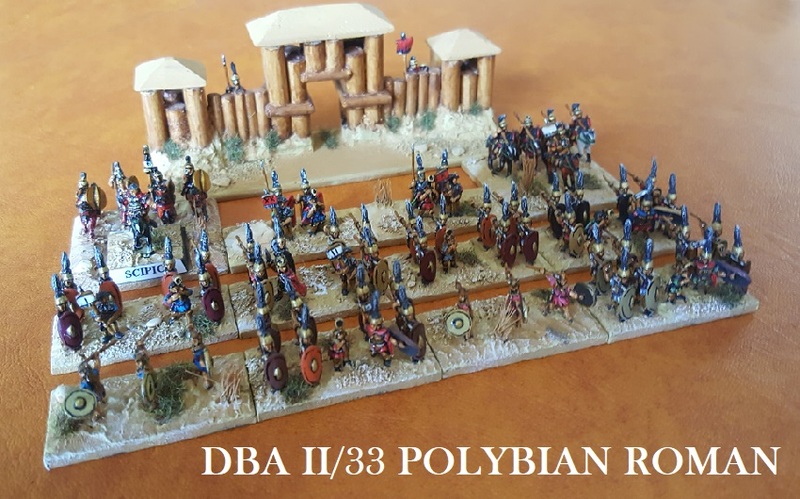 We took along the latest version of my BattleDay promo game, Montaperti, a Basic Impetus Plus participation game in 15mm, now on a browner Tuscan landscape (the battle was fought in early September), and we got a couple of really useful development games under our belt. 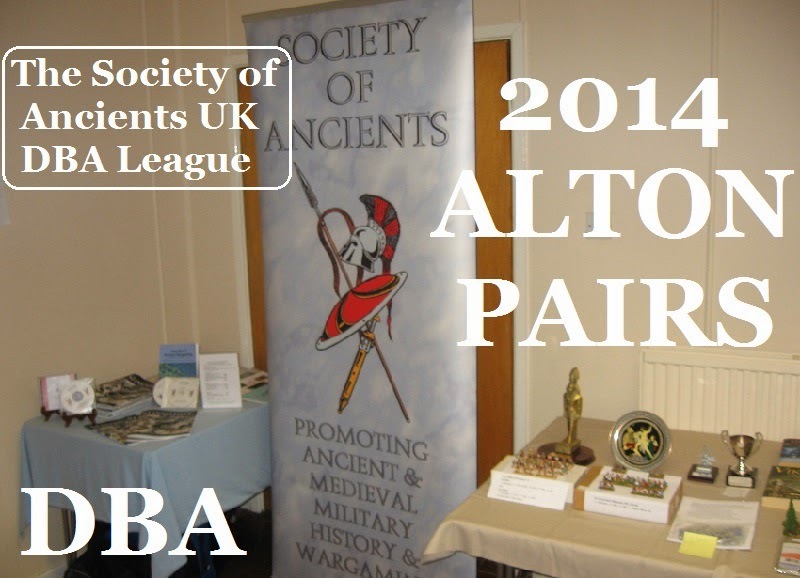 But the Ancient and Medieval content was ourselves (Basic Impetus/Montaperti) and Lance & Longbow (DBA/Wars of the Roses), plus Peter Pig (Longships/Viking raids), Crossed Lances (jousts and tourneys) and Saga. I may have missed something key, of course, but the ones I noticed set a tone that was predominantly Dark Age/Medieval. 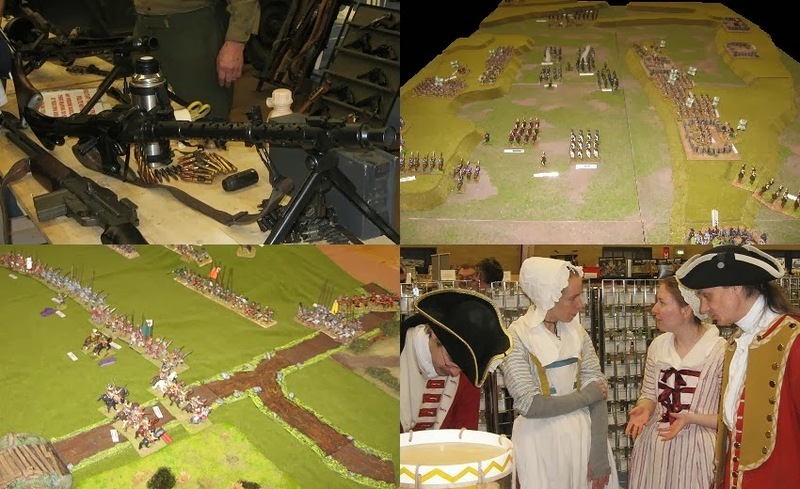 In addition to WWII perennials, there were any number of 17th and 18th Century games (plus the Lace Wars reenactors who are Alumwell regulars) ... and a couple of Zulu War games. Everyone I spoke to was very happy to explain their games and seemed properly briefed to do so ... so thanks to them all for taking the time. 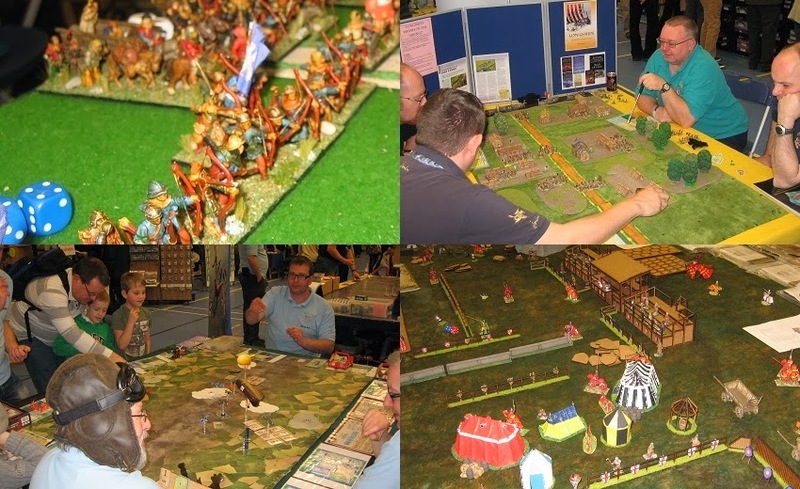 There were quite a few participation games going on ... in addition to Montaperti and the WotR DBA games, Peter Pig's Longships game seemed busy, and plenty of players seemed engaged with the Wings of War table. There were plenty of young faces at this show and they seemed to be enjoying themselves. Apologies to anyone whose game I have missed: I only had a brief window to get round and there was a lot to see. Back with Montaperti, we played through a couple of times with very different results - both of which I think vindicate where the game is going. In the first game, aided by some youthful extreme dice rolling, the inferior Florentines drove the Sienese off but ultimately collapsed as a result of rolling just so many 5s and 6s in cohesion tests. Nevertheless, it demonstrated that the underlying game is reasonably balanced. Apologies to purists for the numeric VBU* tags behind the units (casualties noting each level lost would be better, but I am still getting used to running the whole game, so find the positive numbers make it easier for me to manage). 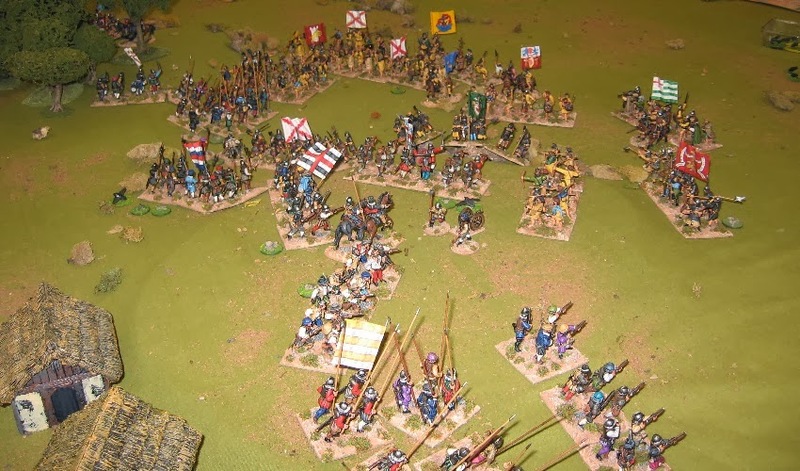 The play was more canny in the afternoon game, but ran to script initially as the imperial and Sienese cavalry broke through the Florentine wing, causing a flurry of activity all along the line. 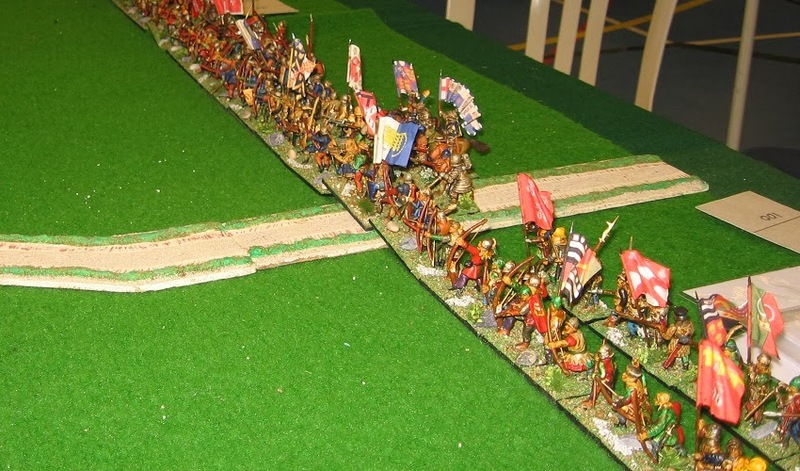 The untrustworthy Ghibelline contingent were ordered up to plug the gap ... and rather surprisingly did so, keeping much of the Sienese wing at bay. 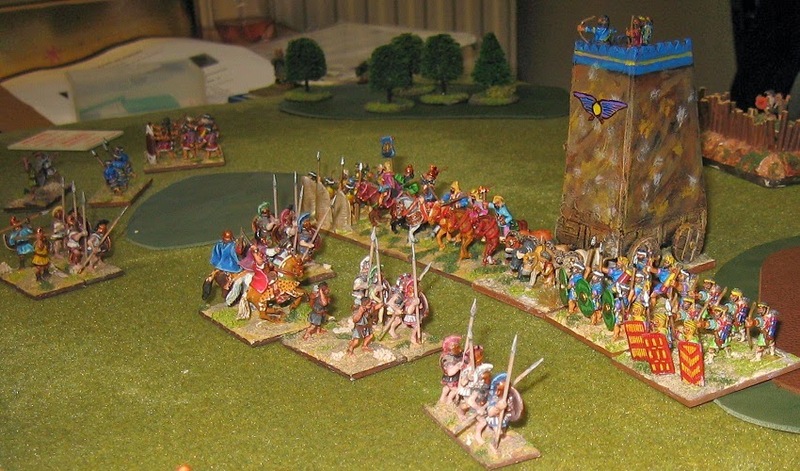 Nevertheless, after their compatriots had fled, it was impossible to block all of the enemy - and a victorious Imperial contingent broke through and attacked the Carroccio/Bell Tower. Although this is a reasonably fair fight, in one calamitous round, the Carroccio's VBU (basic strength) dropped to just 1, seeming to make a Sienese win inevitable. ... or possibly not ... the combatants then failed to register any hits either way, buying time for some plucky Florentine crossbowmen to intervene from the flank, destroying the Knights (as the Knights lost the ensuing melee phase) ... rendering the battle unwinnable for either side (both armies falling below 50% of their total morale values in the following turn). 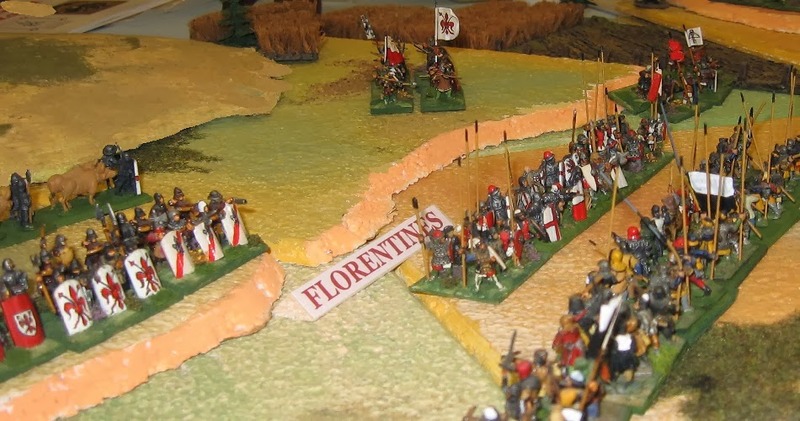 This game certainly did make it seem that the behaviour of the Florentine Ghibellines is key to the outcome of the battle: had they failed to respond to the Florentine flag, this game would have been over very quickly and with scarcely any impact on the Sienese. This year, the Hammerhead show wandered out of February by a week and so I'm afraid it fell off the Shows North schedule for 2014. In fact, we had some possible volunteers, but it wasn't made clear enough to me early on so I didn't book anything. Apologies to all - especially visitors to what I understand was a great little show who may have been looking out for us but been disappointed. 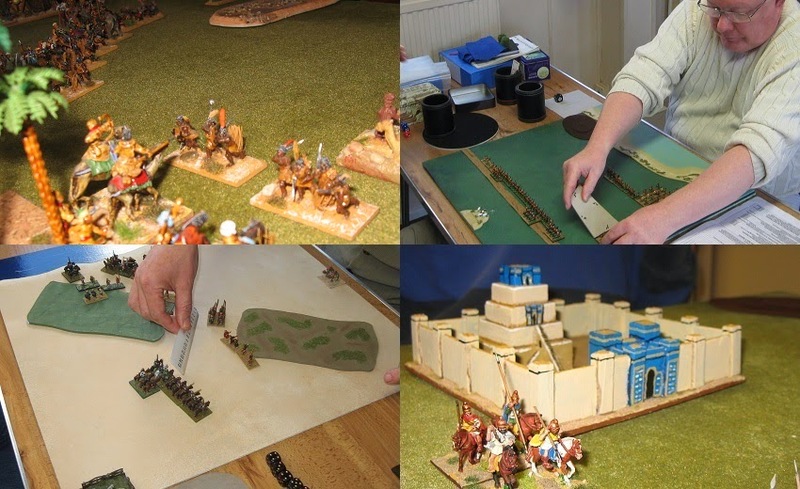 Armati by the Sea is a scenario based competition where the organisers provide everything right down to dice and measuring tools (although bringing your own sticks and bones is accepted). The formula was devised to simplify life for long distance visitors flying in. 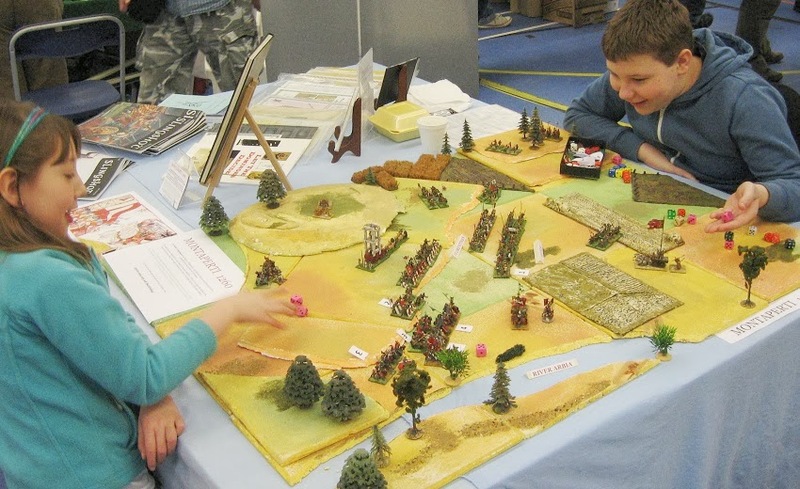 The games are alotted by Swiss Chess, then a numbered coin is drawn from a bag (denoting which scenario) and tossed (marking who gets which army). As you can see, I got a pretty happy outcome ... 2 Biblical; 1 Medieval; 1 edge of the world and 1 Classical Mediterranean. You could argue that Bouvines marked so decisive a shift in the power balance of Europe that it put Prince Louis on the throne of England in 1216. King Louis? You ask .... Well that's a story in English history most commonly glossed over. 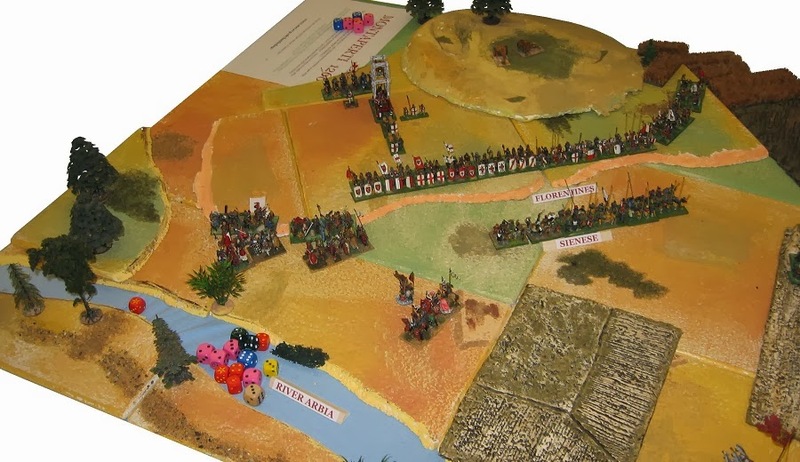 By Sunday morning I was a contender, but my challenge faded away as I failed to win 2-up melee rounds with the Mongols and blundered at the Carthaginians in Sicily. As I say, this was a day for the big beasts, so the traditional presenters were giving each other the awards. 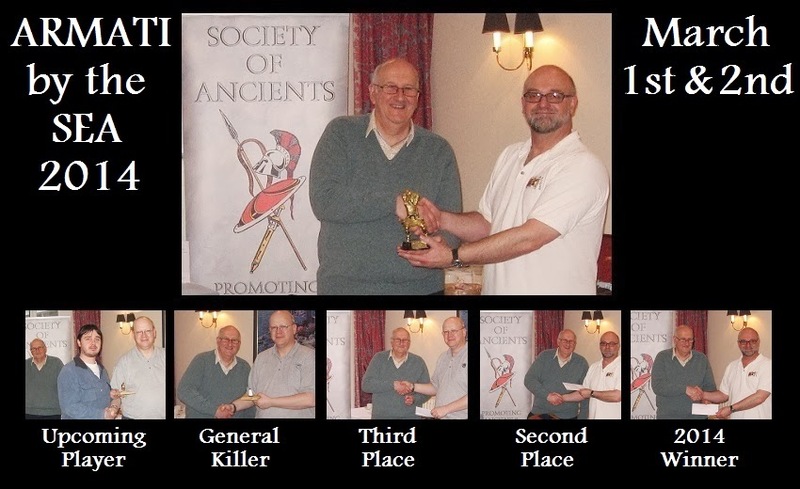 President Roy Boss presented third place to Peter ... Vice President Matthew Bennett then presented second place to Roy ... then metaphorical caps were swapped and Roy presented first place and the Champion's trophy to Matt. See - experience counts in this game! 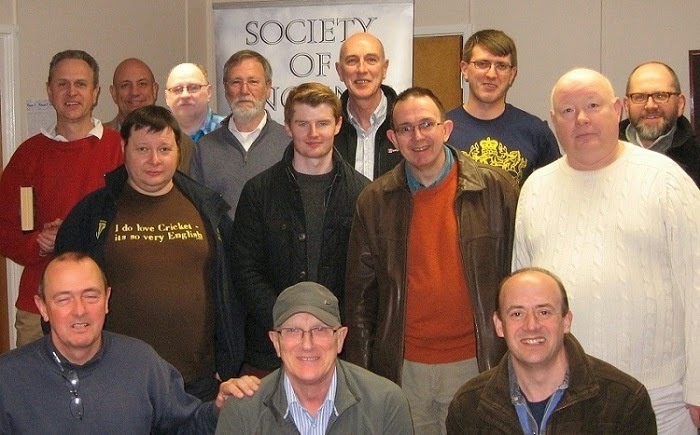 1: Matthew Bennett; 2: Roy Boss; 3: Peter Barham; 4: Craig Tannock; plus Vincent Auger, John Bradley, Ross Finch, Tim Cull, Phil Steele, Mark Fry, Richard Shilvock, Ian Cam, Ian Kerr, Mick Owen, Paul Collins, and Bruce Rollett.